The Eagle F1 GS-D3 is Goodyear's Max Performance Summer radial developed for driving enthusiasts who want more performance from their factory stock or aftermarket-tuned sports cars, sporty coupes and performance sedans. The Eagle F1 GS-D3 excels in wet conditions by delivering class-leading hydroplaning resistance and traction, as well as offers competitive dry performance. Like all summer tires, it is not intended to be driven in near-freezing temperatures, through snow or on ice. The Eagle F1 GS-D3 tires feature Goodyear's AAtrax tread compound molded into a distinctive wet weather racing-derived OneTRED directional tread design and earns the highest "AA" Uniform Tire Quality Grade wet traction rating. The Eagle F1 GS-D3's OneTRED design combines three distinct patterns to enhance dry and wet performance. A solid and continuous center zone maintains constant road contact to enhance straight-line tracking and initial steering response. Next, sweeping intermediate power transfer bridges use "virtual rib" technology that emulates racing slicks by delivering shoulder-to-shoulder tread contact to further enhance steering response and dry road cornering traction. Then, sweeping aquachannel grooves, which are three times longer than the tire's contact patch, angle forward and out to the edges of the tread to avoid trapping water between the tire and the road enhancing wet traction and hydroplaning resistance. And finally, the virtual ribs flow into the shoulder area to form long, stable shoulder blocks that grip the road during cornering and help resist the wear associated with aggressive driving. The tire's structure includes twin, high-tensile steel belts reinforced with spirally wound nylon that distribute the vehicle's load across the tire's footprint to provide high-speed durability and uniform ride qualities. Slightly angled body ply construction with high-ply turn ups enhance steering precision and high speed stability while exterior sidewall rim flange protectors help guard wheels from curb damage. Pros: On my list of tires, the new Goodyear Eagle F1 GS-D3 is the best, all-round, ultra-performance, tire. Of late, Goodyear has been revamping it's ultra-performance, replacement tire offerings for C4s and C5s. 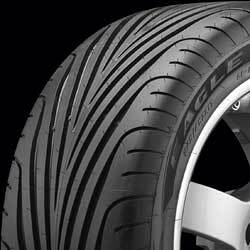 In the Summer of 2002, Goodyear introduced the Eagle F1 Supercar, the OE Z06 tire, in a replacement version sized to fit non-Z06 C5s and some C4s. Several months later, Goodyear debuted a second ultra-performance tire, the Eagle F1 GS-D3. This newest tire fills-out the hard-core, performance end of Goodyear's tire line by replacing the F1 GS for most non-run-flat applications. Currently, the GS-D3 is available in non-Z06 C5 sizes and some C4 sizes. This tire is made, alongside the F1 Supercar, at Goodyear's plant in Lawton, Oklahoma. It's one thing for an ultra-performance tire to work well when the road is dry. It's another for an ultra-performance tire to work well in both wet weather as well as in the dry. Relatively new to the all-weather, ultra-performance tire market is the Goodyear Eagle F1 GS-D3. I'm opinion, based on a lot of subjective testing, is that it surpasses the performances of both the Michelin Pilot Sport and the Bridgestone Potenza on wet roads. Image: Author. How does the F1 GS-D3 compare to the F1 Supercar? Well, the Supercar is still Goodyear's most aggressive, dry traction tire and remains one of the top choices if you want a DOT-legal tire for serious performance driving on the street and occasional trips to the track. The new GS-D3 fits in Goodyear's tire line just a step below the Supercar. It doesn't have the Supercar's limited tread depth and lunatic-fringe dry traction, but it's better in the wet and is just a bit better in tread life, too. It is an improvement over the F1 GS EMT "run-flat" in dry traction, noise and ride. By virtue of a completely different tread design, the tire's performance on wet roads improves over EMT's, too. For the C4 driver, the F1 GS-D3 is a significant improvement over the Eagle GS-C that was O.E. on those cars. Side by side are Goodyear's two "big dogs" for the C4 and C5, the F1 Supercar (left) and the F1 GS-D3. The differences in tread design are significant. At left, the F1 Supercar's tread is designed to have outstanding dry traction performance. It's wet performance is good but not great. At right, the F1 GS-D3's tread is designed to have great wet traction performance as well as very good dry traction performance. In addition, by virtue of a slightly deeper tread, the F1 GS-D3 might have better tread life. Image: Author. In the last eight months I've tried the F1 GS-D3 on a C5, a C4, a late model Camaro and an Audi A4 sedan. I've done this testing on city and suburban streets, highways, curvy mountain roads and on selected sections of Goodyear's Proving Ground at San Angelo, Texas. Some of this testing was done on either public roads in wet weather or on special wetted test course at the Proving Ground. The Goodyear San Angelo facility's vehicle dynamics area, a 540,000 sq/ft. asphalt pad (for comparison, a football field is only 90,000 sq/ft.) was the site of some wet handling tests I ran. The "VDA" has a 1-degree slope and a water distribution system that spreads a layer of water, .050-.060-in. thick over the entire facility. Goodyear had turned on the water and set up a braking test and a low-speed autocross. The cars used for testing were C5s with automatics and base suspensions. One had a set of Michelin Pilot Sports. A second had a set of Bridgestone Potenza S-03s and the third car had F1 GS-D3s. Tire sizes on all cars were stock. Tire pressures were 30 psi cold. The VDA at Goodyear's Proving Ground is the size of half-a-dozen football fields and has a one-degree slope. A sophisticated water speading system can cover it with a layer of water up to .060-in. thick. Image: Aaron Vandersommers. The braking test was from 55 mph. The Pilot and the Potenza brought the car to a stop in 87-90 feet. The new Goodyear's performance was 83-85 feet for an approximate, 5% improvement. At first, 5% might not seem like a significant difference, but consider: in many wet weather driving situations requiring the car's full braking ability, you're doing so under emergency conditions and an extra 5% shorter stopping distance might mean the difference between wrecking and being able breathe a sign of relief while thinking, "Whew! I'm glad I got the car stopped!" In the wet slalom, the best tire on a C5 was the F1 GS-D3 ahead of the Pilot Sport and the Potenza. Image: Aaron VAndersommers. The autocross was not timed and was used as a subjective evaluation of the car's limit handling on a wet surface. After driving all three tires, I felt the Goodyear had a slightly higher breakaway limit in the wet than both the Pilot Sport and the S-03 Pole Position. Also, compared to the Bridgestone, the Goodyear was more predictable. Once the Bridgestone began to slip, it broke-away abruptly. With the Goodyear, things happened just a bit slower. I observed two different drivers spin the Bridgestone-shod car in the same spot on the course. None of the Goodyear cars, regardless of who was driving, spun in that spot. It was a place where an unprepared driver was liable to lift abruptly in a turn. Once the Bridgestone hits its limit in the wet, it breaks-loose instantly. Not a good thing, in my opinion. For all three tires, Goodyear supplied traction coefficient vs. percentage of slip data taken at 60 mph in the wet. While at that higher speed, each tires' hydroplane characteristics may have had a slightly greater impact, the data seemed to confirm what I'd felt in the 40-50-mph slalom. This data showed that the F1 GS-D3 is a moderate improvement over the Michelin and slightly better than the Bridgestone, until the slip angle reaches 30-deg. Past that (angles you'd almost never see unless you were loosing or had lost control of the vehicle) the Bridgestone and the Goodyear are about the same with both having an edge over the Michelin. I asked Goodyear Engineer, Melissa Montisano, what features of this new tire would cause it to better both those other, admittedly good tire brands in the testing I did. She told me that in the 55-mph. braking test and low-speed autocross, on surfaces wetted to a depth of .050-.060-in., the tires' hydroplaning characteristics are not the most critical factor. What makes the F1 stick better in the wet at those speeds is its tread design, its tread compound and the size of its footprint. I've had yet a third opportunity to test the Goodyear F1 GS-D3, but for a longer duration and on more familiar vehicles: my own '95 Corvette (275/40ZR17 front, 315/35ZR17 rear) and '01 Camaro (245/50ZR16 all around). Last fall (2002) I installed the tires on both cars and this past winter (2002-2003) I had a chance to try both cars at speeds up to 85 mph during several winter storms that battered the Southern California area in February and again in April. Since I put the tires on last fall, I have put 14,500 test miles on those two cars using the F1 GS-D3. My 14,000 miles test of the GS-D3 included more than just running around on Goodyear's proving ground. I put a set of the tires on my own C4 and tested them in good weather and bad. Image: Author. The most noticeable visual trait of the GS-D3 is the "V-TRED". In fact, vaguely similar tread patterns are seen on a few other brands of tires and are perceived by some as a fad or a status issue. In fact, the GS-D3's tread is a critical part of this tires excellent wet performance characteristics. No doubt, this deep V tread works. On a number of occasions, driving at the speed limit or higher on the Interstates around the L.A. area, during heavy rain storms, I hit scattered spots of shallow standing water, some perhaps deeper than what was on Goodyear's VDA. These new Goodyears were able to roll on though without any serious hydroplaning. As to why V-TRED works, I learned that at the "Glass-Plate" testing facility at Goodyear's Proving Ground. You may have seen images of tires, rolling across wetted-down, glass plates. San Angelo's Glass Plate facility is where Goodyear does that kind of test work. It's not often that tire companies invite writers to visit the venues they use for this kind of testing, much less let them go down into the underground lab beneath the plate and watch their engineers at work, but Goodyear did that for this Corvette Action Center review. The actual plate is about 18-in. wide, 36-in long, 4.5-in. thick and covered by an .080-in. of water. The Glass Plate control system is designed to hold that water depth accurately as long as the wind is less than 2-mph. If the wind velocity is higher than that, no testing is conducted. After each run across the plate, automated equipment cleans off the plate and restores the water layer to the .080-in. depth. The plate itself is scientific-grade, optically-correct glass. The imaging equipment is digital and computer-controlled. Strobes are used to light the tire as it crosses the plate and the water is dyed green, which shows up best in a color image. While we were in the "Pit," a Goodyear test driver ran a C5 Coupe fitted with F1 GS-D3s over the plate a couple of times at 40 mph while I watched the test images get processed then looked at the results. This is the top-side of Goodyear's Glass Plate Facility at San Angelo. This image was shot as a C5, moving at 60 mph, crossed the plate. Image: Aaron Vandersommers. This is the same tire on the same car from underneath. It was shot with Goodyear's special imaging equipment. Image: Goodyear Tire and Rubber. Here's another interesting tire testing device I saw in operation at Goodyear's proving ground. The trailer can carry various weights and is equipped with a braking device. In this image, the trailer is fitted with a C4-Corvette-sized F1 GS-D3. The trailer is used to evaluate wet traction at various levels of weight on the tire. Image: Aaron Vandersommers. Goodyear-supplied data accumulated at this facility for the Bridgestone Potenza S-03, the Michelin Pilot Sport and the F1 GS-D3. Typically, this data is taken at 2mph (which establishes a 100% footprint "baseline"), 40 mph, 60 mph and sometimes higher speeds, depending on the tire or the testing required. In this case, the data was for 2, 40 and 60 mph. At 2mph, obviously, all three had 100% of the footprint area retained on a pass through the .080-in water. At 40 mph, They varied from 88% area retention for the Goodyear and the Bridgestone to 91% for the Michelin. At 60 mph, things changed. The Michelin dropped to 61% of the area retained. The Bridgestone was at 64% and the Goodyear was at 67%. If you want to go fast in the wet, the best hydroplaning resistance in the ultra-performance tire market, right now, comes with the new GS-D3. This tire's improved resistance to hydroplaning comes from the V-TRED technology. Circumferential, water-evacuation channels, such as Goodyear uses on the Aquatred 3, wouldn't work on a tire like the F1 GS-D3 because they'd degrade its dry-traction capability. The solution is long, sweeping grooves that are at an angle, but not as sharp an angle as seen on previous Goodyear performance tires. The V-TRED grooves extend more than three times the length of the tire contact patch. When the tire is rotating these grooves greatly enhance the flow of water to the outside of the tire's tread, yet still put lots of rubber on the road. At one of Goodyear's web sites, www.eagleF1.com, is an outstanding, graphical display of the V-TRED idea along with a lot of other pretty cool image stuff. You need the latest Macromedia Flash plug-in for your browser to view it. During testing for the F1 GS-D3 on my own car, I drove one of my favorite road test roads, the Angeles Crest Highway, at high speed in a driving rainstorm. Image: Author. Now, back to real world testing. In SoCal, during the storm in April, I decided to take my Corvette over my 38-mile "test loop" of mountain roads in the Angeles National Forest north of L.A. Now, this is normally where I road test cars to subjectively evaluate their at-limit handling but, up until then, I'd always done that in the dry. I wanted to see how these new tires would work in a real world wet test over a road I new well, so "The Crest" was my choice. My loop starts on Angeles Crest Highway. I turn left on the Angeles Forest Highway. Then, I go right on Upper Big Tujunga Canyon and right again back on Angeles Crest. When I pass the junction of Angeles Crest and Angeles Forest a second time, I've run 38 miles. The day I was up there the weather and road conditions varied from breaks in the clouds with the road almost dry in spots to heavy rain with water and even mud draining across the road. The Crest is a potpourri of driving challenges with everything from fairly tight groups of linked turns characteristic of a fast autocross to some fairly long straights. In this mix are sweepers, esses, off-camber turns--basically, a little of everything. The two characteristics of the F1 GS-D3 that came though clearly in this test were: 1) the tire's resistance to hydroplaning and 2) its predictability at the limit on wet surfaces. This testing convinced me that the best choice in an all-weather, ultra-performance tire for a Corvette (or any just about any performance car, for that matter) is a Goodyear Eagle F1 GS-D3. When I pick bad weather for tire testing, I don't fool around. I shot this in the area where we were wet testing. At higher altitudes that day, it was snowing hard. This was a CalTrans snow plow heading for the higher elevations. Image: Author. During my visit to Goodyear's Proving Ground, I spent some time on its 2.5 mile road race course subjectively evaluating the F1 GS-D3's at-limit, dry traction. The test car was an Audi A4 sedan with a 220hp V6 and a six-speed manual trans--not really a car I'd choose to use for a tire test, but one that is, nevertheless, in the less-aggressive end of the target market for this tire. Again, the tire sizes were stock and the tire pressures were 30-psi cold. Variety is the spice of tire testing so I went from wet weather to dry when I ran the F1 GS-D3 on a short road race track at Goodyear's Proving Ground. As you can see from the front tires, the Audi A4 is not the best platform for really fast driving. This images explains why the front tires showed signs of the sidewalls rolling under. Image: Aaron Vandersommers. I ended up being quick time of the day amongst all other writers present so, even though I'd never driven that track and never driven an all-wheel drive car, I knew I'd run the new Goodyears harder than anyone else present. There was no competing tire products to test so about the only conclusions I could draw were: 1) the F1 GS-D3 is quite predictable, certainly more so than an old GS-C and better than the F1 GS and 2) it is a pretty forgiving tire in that you could take them right up to the limit, then stray back and forth just across it, and not abruptly end up in the weeds. As fast as I ran the tires, it was difficult to gain much more of a subjective impression because an Audi A4 is not the best platform for testing like this. It felt quite heavy for its size, has too much body roll and an awful shift linkage. Additionally, the 30-psi cold figure was probably too low for that car as the outside edges of the front tires showed clear evidence the sidewalls were rolling under. I also had a real-world, impression of the F1 GS-D3 in the try during part of my Angeles Crest trip. On Upper Big Tujunga Canyon Road, the surface was nearly dry for one 2-3 miles stretch. I was able to run pretty hard. As the tires on the car just before I put the GS-D3s on were F1 Supercars, I could make a pretty good subjective comparison. The F1 GS-D3 doesn't have quite the extreme dry traction limit but the difference is quite subtle and only the most aggressive driver will notice it. Because the GS-D3s I was testing were at full tread depth and their tread is deeper than that of the Supercar, at the limit you can detect the GS-D3's tread is moving around a bit but, again, this is something only the most aggressive and perceptive driver will experience. Overall, the F1 GS-D3 is exactly the dry traction tire Goodyear claims it to be--just a small step down from the F1 Supercar. Goodyear engineers added a few extras to the F1 GS-D3 such a "rim flange protector" on the sidewall which prevents wheel damage if you scuff the tires up against a curb. Image: Author. 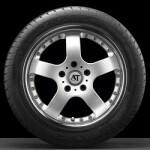 This tire, in a limited amount of sizes, was introduced over in Europe back in the spring of '02. American car magazines seldom do tire tests these days, but tire testing is wildly popular amongst the European automotive press. In the six months following the European debut, the British magazine, EVO and the German publications Auto Zeitung , Sport Auto and Auto Bild all ran tire comparison tests and Auto Bild has run two. Each of these tests included the F1 GS-D3. In the interest of saving space, I can't list all those results, but suffice to say, the new Goodyear was an outright winner in some of these tests and placed very well in all of them. My guess is, further details of these tests can be found on each magazine's web sites and, perhaps, English versions of the data may be on Goodyear's site. At this point, I'm a believer. In fact, I like the tire so much, as one of the Captains of the Southern California Section of the 50th Anniversary National Corvette Caravan in late June of '03 and the driver of the SoCal Caravan's lead car, I left the F1 GS-D3s on the car for the Caravan. On the trip we had good weather most of the trip but the final day's drive, though eastern Arkansas, western Tennessee and southcentral Kentucky, it rained. In fact, during parts of that day, it freaking poured. The F1 GS-D3 gave me the dry traction and handling I wanted but also some outstanding performance and safety on wet roads which I needed to lead hundreds of cars during the five-day trip to Bowling Green. My initial impression of the Goodyear F1 GS-D3 on my own C4 was so good that I decided to keep a set on the car for the 4600 mile 50th Anniversary Corvette Caravan from Southern California to Bowling Green. Image: Sandy Rubel. If you're read this far you might be considering a purchase of F1 GS-D3s. If you own a later C4 that came stock with EMTs or a C5, you might be wondering about running a non-EMT tire on a car which has no spare. The solution is the "Tire Inflation Kit" GM includes with every Z06 and many C5s exported to markets where run-flat tires are not used. The Inflation Kit includes an aerosol can of sealant and a 12-volt air compressor. You inject the sealant into the flat tire with the aerosol can then re-inflate the tire with the compressor. This kit will fix any small leak such as what you'd get from a nail, a piece of glass or other small road hazard. While the Inflation Kit works very well for most typical leaks, it will not solve problems with significant tire damage such as the large holes EMTs can sustain and still be driven limited distances. There is also another difficulty with the Inflation Kit and that is, after its used to fix a leak, the Low Tire Pressure Warning System sensors used on C5s will usually be damaged by contamination by the sealant. Unfortunately, these are compromises you must accept if you want the better performance and less noise available from a non-EMT tire. On my list of tires, the new Goodyear Eagle F1 GS-D3 is the best, all-round, ultra-performance, tire. Pros: Very predictable tire on dry roads, and superb on wet. Currently on my third set of these. All sets run on a 2003 roadster I drive like I stole it. Very impressed with the even tire wear I have gotten all the way around. I do however wish they made a 305/30/19 or 315/30/19 series for the rear as the 285/30/19 I have on it looks a little stretched for the rim width I am running. I will not spend any time reviewing the merits of this tire used as designed (summer) since Hib has already provided a true review. I will comment on the use of these tires in freezing weather. These tires are not recommended for freezing or near freezing weather. I live in central Arkansas. Here the temperatures drop to freezing and below on a regular basis from October thru March. However, there are not too many days where the temp is near or below freezing for the morning and afternoon commute. In very cold weather (teens) the tires seem like they are solid and almost seem to slide across the driveway when the wheels are turned hard. At freezing or just above the tires feel normal and they drive without problems. I would not try to drive the car in snow. On the rare days that we do get snow I don't grive at all. On cold days I drive the car and I do not push it around curves and I allow a little extra stopping distance between myself and others. Except for the precautions mentioned above I drive with these tires year round with no problems. I will be careful rather than switching to all seasons tires. I just hate to give up the tremendous performance that these tires provide. I got 28K + out of the last set of the GS-D3s and I could have comfortably gotten over 30K. I was headed out on a road trip so I decided to go ahead and replace the worn tires before I left. 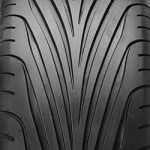 The above comment that the Goodyear F1 GS-D3 is a "Summer" tire is incorrect and based on opinion rather than actual testing. The person posting faults the D3 for being a "Summer Tire based on his expectation that it will have good traction in below freezing temperatures. The Goodyear F1 GS-D3 is an outstanding dry and wet traction tire. That it can be used in above freezing cold weather in the winter is demonstrated clearly in my test...see the pictures of the car being driven in the rain in February? Further evidence that it was being used with good results in cold but not freezing weather is the picture of the snow plow truck, on the same road at the same time, headed for higher altitude. What the D3 is not is an "all season" or "snow" tire. Anyone trying to use it that way is a fool. If you are occasionally driving a Corvette in below freezing temperatures in light snow or minimal icing, you need the Goodyear F1 All-Season, which is available in some but not all C5 sizes, or similar tire from an other manufacturer. If you drive your Corvette regularly in below freezing weather over snow-covered roads or roads with significant icing, you need a true "winter" or "snow" tire, such as the Bridgestone Blizzak. Bottom line. The F1 GS D3 is a "summer tire" but it's also a cold and wet weather tire. It is not an all-season or snow tire. I've used regular D3's on my C4 and was very happy with them. Quiet, all weather, great traction and long life. I'm using EMT versions on my CTS-V now and I'm very happy there also. The origina Super Car tires on the "V had great dry traction but sucked in the rain and were awful on snow - and they wore out fast. The D3's on the "V" have have nearly the same dry summer performance, are excellent in the rain and worked okay on ice recently. They still have plenty of tread left with twice as many miles on them as the Super Car tires. To bad they don't come in EMT sizes for all the Vettes. Tuna My Novels: Crossbow Revenge Alice Was Not Her Name Antiques To Die For HyperDeath Murder mysteries!